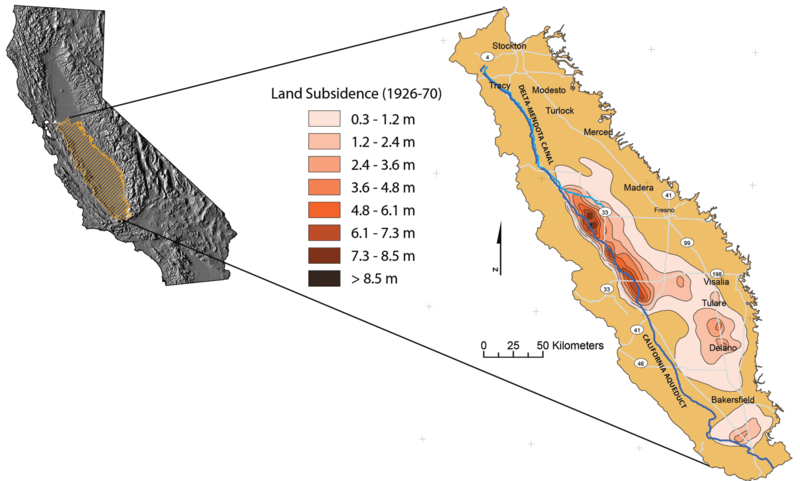 Extensive groundwater withdrawal from San Joaquin Valley aquifer system has caused renewed land-surface elevation drop (subsidence) that could result in serious operational and structural issues for the Delta-Mendota Canal (DMC). In response, the USGS is studying and providing information on groundwater conditions and land subsidence in the San Joaquin Valley. Groundwater pumping caused widespread compaction and resultant land subsidence between 1926 and 1970, locally exceeding 26 feet. Surface-water imports in the early 1970s resulted in decreased pumping, reduced compaction rate, and a steady recovery of groundwater levels. However, lack of imported surface-water availability during 1976-77, 1986-92, and 2007-09 caused groundwater-pumping increases, renewed compaction, and declines in water-levels to near-historic lows. The resulting land subsidence has reduced the freeboard and flow capacity of the Delta-Mendota Canal, the California Aqueduct, and other canals that transport floodwater and deliver irrigation water , requiring expensive repairs. One area of the Central Valley, southwest of Mendota, has experienced some of the highest levels of subsidence in California. From 1925 to 1977, this area suffered over 29 feet of subsidence. Land subsidence in the San Joaquin Valley, California, 1926-70 (modified from Ireland and others, 1984). The canal begins at the C.W. Bill Jones Pumping Plant, which pumps water 197 feet from the Sacramento-San Joaquin Delta. The canal runs south along the western edge of the San Joaquin Valley, parallel to the California Aqueduct for most of its journey, but it diverges to the east after passing San Luis Reservoir, which receives some of its water. The water is pumped from the canal and into O'Neill Forebay. Then it is pumped into San Luis Reservoir by the Gianelli Pumping-Generating Plant. Occasionally, water from O'Neill Forebay is released into the canal. The Delta-Mendota Canal ends at Mendota Pool, on the San Joaquin River near the town of Mendota, 30 miles west of Fresno.